Two decades of warfare had cost the lives of between one- fourth and one-third of Venezuela's population, which by 1830 was estimated at about 800,000. Furthermore, the cocoa-based export economy lay in ruins, a victim of physical destruction, neglect, and the disruption of trade. As a result, it was relatively simple for the young nation to shift its agricultural export activity to the production of coffee, a commodity whose price was booming in the North Atlantic nations with which Venezuela was now free to trade. The production of coffee for export would, along with subsistence agriculture, dominate Venezuela's economic life until the initiation of the petroleum boom well into the twentieth century. Venezuela's century-long post-independence era of caudillismo is perhaps best understood as a competition among various social and regional factions for the control of the Caracas-based bureaucracy that served the trade with the North Atlantic nations. The century of the caudillo started auspiciously, with sixteen relatively peaceful and prosperous years under the authority of General Páez. Twice elected president under the 1830 constitution, Páez, on the one hand, consolidated the young republic by putting down a number of armed challenges by regional chieftains. On the other hand, Páez usually respected the civil rights of his legitimate political opponents. Using funds earned during the coffee-induced economic boom, he oversaw the building of fledgling social and economic infrastructures. Generally considered second only to Bolívar as a national hero, Páez ruled in conjunction with the criollo elite, which maintained its unity around the mestizo caudillo as long as coffee prices remained high. In the 1840s, however, coffee prices plunged, and the elite divided into two factions: those who remained with Páez called themselves Conservatives, while his rivals called themselves Liberals. The Liberals first came to prominence in 1846 with Páez's surprising selection of General José Tadeo Monagas as his successor. Two years later, Monagas ousted all the Conservatives from his government and sent Páez into exile, precipitating a decade of dictatorial rule shared with his brother, José Gregorio. The abolition of slavery in 1854 was the only noteworthy act by the Monagas brothers. In 1857 they introduced a new constitution in an obvious attempt to install a Monagas family dynasty. The regime was ousted the following year in a revolt that included elite members of both parties. The elite factions failed to agree on a replacement for Monagas, however, precipitating twelve years of intermittent civil war so chaotic that few history texts bother to chronicle the details. Between 1858 and 1863, local caudillos engaged in a chaotic power struggle known as the Federal War, because the Liberals favored federalism. In the end, the Liberals triumphed and General Juan C. Falcón was named president. In practice, federalism was a disaster. Falcón's general lack of interest in ruling and his failure to exert strong leadership allowed local caudillos to exert oppressive authoritarian control over their fiefdoms even while they continued to pay lip service to the concept of federalism. Central government authority was finally restored in 1870 by Falcón's chief aide, Antonio Guzmán Blanco, who established a dictatorship that endured for eighteen years. Unlike his former boss, Guzmán understood the politics of federalism. After removing disloyal Conservative regional caudillos by force, he installed a loyal group of Liberal caudillos in their place. Thanks to a rapid expansion of both coffee production and foreign loans, Guzmán had access to considerable resources to maintain his supporters with generous subventions, backed up, if necessary, by federal troops. This formula brought nearly two decades of much-welcomed peace to the Venezuelan countryside. Guzmán used the increased revenue for additional activities that contributed to Venezuela's national development. Education advanced notably, while the development of a modern governmental bureaucracy, and infrastructures for communications and transportation--roads, railroads, port facilities, and telegraph lines--provided vital support for expanding export agriculture. Caracas especially benefited from public works and grew into one of South America's premier cities. The vainglorious Guzmán, who liked to be referred to as the "Illustrious American," dedicated as many of these projects to himself as possible. Although Guzmán demanded honesty from his subordinates, he amassed a personal fortune that allowed him to live in the kingly luxury he felt he deserved, both in Caracas and in Paris during the intervals when he deemed it prudent to leave the presidency in the hands of a puppet. During one such period in 1888, civil unrest marked by anti-Guzmán rioting by university students in Caracas convinced the "Illustrious American" to remain in Paris on a permanent basis. The four chaotic years that followed Guzmán's rule were marked by several failed attempts to consolidate a civilian government. 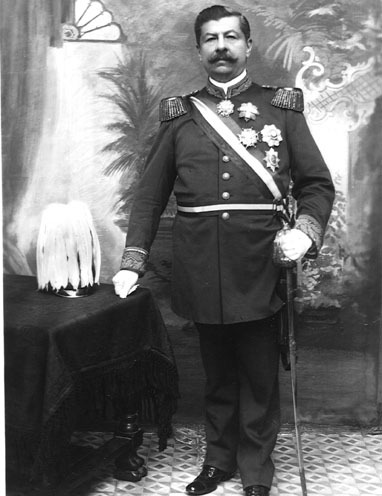 A colorless military regime, led by General Joaquín Crespo, spent most of its energies between 1892 and 1898 fighting to remain in power. Crespo was killed in 1898; in 1899 General Cipriano Castro, the first of four military rulers from the Andean state of Táchira, marched on Caracas with a private army that became a strong naitonal army and assumed the vacant presidency. Castro was characterized as "a crazy brute" by United States secretary of state Elihu Root and as "probably the worst of [Venezuela's] many dictators" by historian Edwin Lieuwen. His nine years of despotic and dissolute rule are best known for having provoked numerous foreign interventions, including blockades and bombardments by British, German, and Italian naval units seeking to enforce the claims of their citizens against Castro's government. The subsequent appearance of United States warships in 1902 convinced Castro to acquiesce to a financial settlement. Five years later, however, he again incited foreign naval intervention, this time by the Dutch, who seized a port and destroyed part of Venezuela's tiny navy. In 1908 Castro traveled to Europe for medical treatment; his chief military aide and fellow tachirense (native of the state of Táchira), Juan Vicente Gómez, took this opportunity to overthrow the dictator and assume power. Gómez was the consummate Venezuelan caudillo. He retained absolute power from 1908 to 1935, alternating between the posts of president and minister of war. A series of puppet legislatures drafted and promulgated six new constitutions at the bidding of the dictator, while the judiciary enforced the will of the "Tyrant of the Andes" within the courts. The dictator's principal power base was the army. Disproportionately staffed with tachirense personnel, the army was used to destroy all of Gómez's regional foes. This "national" army was prudently provided with high salaries and generous benefits, the most modern weapons, and instruction from the Prussian-trained Chilean military. But Gómez's most important means of eliminating political foes was his ubiquitous secret police force. Although some opponents escaped with a simple reprimand, many thousands of others, those who did not manage to escape into exile, were locked up--rarely with the benefit of a trial--in prisons where death by starvation or at the hands of torturers was commonplace. Gómez justified his harsh dictatorship as the form of government preferred by the primitive, mixed-race Venezuelans. He based his theories in part on the racist notions of the book Democratic Caesarism by Gómez supporter Laureano Vallenilla Lanz that became official regime doctrine. In accord with these theories, Gómez believed that national development could be undertaken successfully only by foreigners who enjoyed technological superiority to Venezuelans. Moreover, the climate of stability required for this externally directed development process could only be provided--according to Gómez's doctrine--by strong authoritarian rule. The Gómez regime coincided with a protracted period favorable to Venezuelan exports. Coffee exports boomed, both in volume and price, during the early years of his rule. Most important, however, the foreign exploitation of Venezuela's petroleum reserves began in 1918, augmenting government revenues to a degree previously unknown and allowing Gómez to pay off the nation's entire foreign debt and to institute a public works program. The beginnings of an urban middle class were also evident in the bureaucracy that grew up around the nascent Venezuelan oil industry. The provision of required local services to the oil industry further expanded this new middle class. The true beneficiaries of the petroleum boom, however, were Gómez, the army, and the dictator's associates from Táchira. For the vast majority of Venezuelans, the petroleum era brought reduced employment (oil being a capital-intensive industry) and high food prices stemming from a decline in domestic agricultural activity and an increase in imports. Inflation increased and real wages declined. Little improvement took place in public education and health care, and although the capital-intensive petroleum industry grew impressively, oil-derived revenue was not applied to labor-intensive efforts such as agricultural diversification or the promotion of small-scale industry. Subsequent events recast the students at the Central University of Venezuela, in Caracas, into the most significant opposition to the Gómez regime. Having closely observed the Mexican Revolution of 1910 and the Russian Revolution of 1917, the students launched a struggle in 1928 to liberate Venezuela from Gómez's grip. The revolt began in February, when Jóvito Villalba and two other students were arrested for making antigovernment speeches. In protest, other students then challenged the dictator to jail them as well, and Gómez complied by arresting 200 student activists. A popular demonstration followed. Police dispersed the demonstrators with firearms, killing and wounding many participants. With the assistance of a few young military officers, the rebels then stormed the presidential palace, which they managed to occupy briefly before being overwhelmed by Gómez's troops. Gómez then closed the university and rounded up the students, many of whom ended up laboring on road gangs. Some of the movement's leadership languished or died in prison; those of "the generation of 1928" who managed to escape into exile, like Rómulo Betancourt, Rafael Caldena Rodríguez, and Raúl Leoni, were later to become the nation's principal political leaders. Two subsequent efforts to overthrow Gómez--executed by long- exiled caudillo rivals who believed that their landings on the Venezuelan coast would trigger popular insurrections--ended in failure. The "Tyrant of the Andes" ruled until his death, by natural causes, in December 1935 at age seventy-nine. The event precipitated widespread looting, property destruction, and the slaughter of Gómez family members and collaborators by angry mobs in Caracas and Maracaibo. Gómez's twenty-seven years in power brought to a close Venezuela's century of caudillismo and, according to many historical accounts, his demise marked the beginning of Venezuela's modern period. Although he was not the last of Venezuela's dictators, analysts of contemporary Venezuelan society commonly cite Gómez's lengthy rule as the true line of demarcation between Venezuela's democratic present and its authoritarian past. Although the nation's post-1958 democratic leaders received their political baptism of fire in Venezuela in 1928, their principal political, social, and economic perceptions were formed in exile in Europe, Mexico, or the United States. During the transition years from 1935 to 1958, the outlines of a national democratic political culture, including the configuration of Venezuela's modern political party system, at last began to take shape.